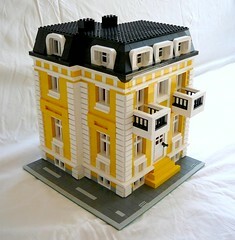 Brick Town Talk: LEGO House - LEGO Town, Architecture, Building Tips, Inspiration Ideas, and more! Yellow is a hard color to use in realistic buildings in my opinion, but Flickr user georgivar obviously had no trouble doing that. Added with the white brick corners and second story balconies, this building makes for a really nice European style structure. Great job on this one!